The course is designed with (7) stations and a 50 target round, with plenty of room to expand. It offers some unique shots, and you are sure to enjoy the rabbit station with bouncing targets in a crossing pattern! It is set amidst some of the best Quail and Chukar habitat the west has to offer. This makes it a very realistic wingshooting experience. We have professional instructors that will make learning to shoot sporting clays and handling firearms, fun, safe, and welcoming. 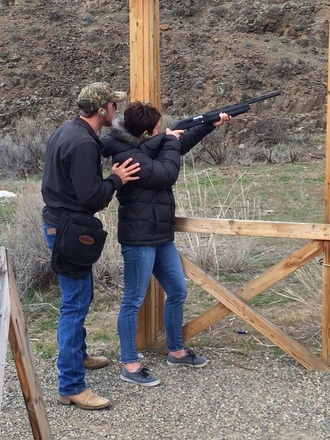 Our 2 hour classes are taught directly to the shooter skill level and groups of mixed experience are no problem. We can teach experienced vets a few things about the various challenges on the course and take beginners through a short but effective lesson on how to handle firearms safely and the basics of shooting. We embrace the opportunity to bring new shooters out on our course and teach sport shooting in a safe, fun, and simple format. Our first emphasis is on safe firearm handling and secondly on how to properly mount and site the gun, track, and shoot flying targets. Our group of professional instructors are dedicated to making sure your first shooting experience is safe and rewarding. Canyon River Ranch is located alongside the famous Red's Fly Shop in the Yakima Canyon. In fact, Canyon River Grill is inside the fly shop! We even have a private boat launch and take out allows for easy access to the Yakima River. The Red's Fly Shop team is prepared to help you enjoy fly fishing on the Yakima River or on other nearby fisheries. You can take a guided trip, get good advice, or even rent fly fishing equipment or fishing raft. Whatever you need... they've got it!